alright i have picked up a new favourite word 'alright' from thomas kerschbaumer. i think that's how i spell this italian's name. okay went out after hr training with xiuqi. we had the azabu sabo ice cream after our lesson which ended at 3 instead of the original 6pm. heehee yah i had this dark choc ice cream which sorta killed my throat for 5 minutes after the first few mouthfuls. heehee xiuqi had this green tea flavour which she totally adored, though i didn't really find it to be very tasty. oh we chanced upon this nus high school string ensemble thingie at esplanade and decided to sit down and listen. they also had this guy and girl voice solosists who i did not really like. so many of my friends are leaving me to go overseas to study. AGAIN. 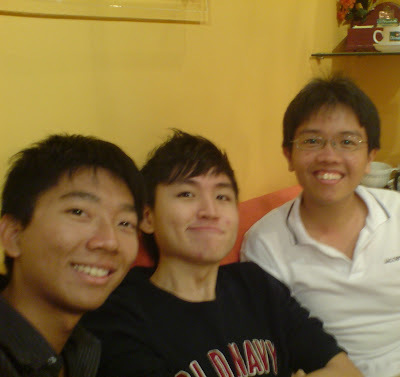 yah had my last outing with lip yong and raymond yest before lip yong leaves for perth on thur. well i was really sad when i was writing his card at home. 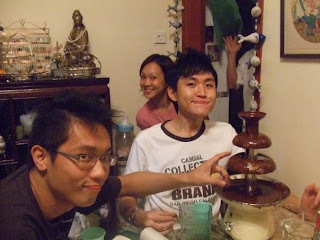 we had known each other for 10 years and he is really one of my best-est friend lor. i think i will really miss him leh. ever since we met raymond we have been celebrating our birthdays together...but i think we can't do it for this year cuz he will be in australia while we will still be in singapore. 1. yah i know i only know how to deal with bread. 2. melvin's miso soup was really goottttttt, though the fish bones can be a little irritating. 3. we enjoyed playing saboteur. ALOT. went to sing karaoke with teck kuan and joel. really enjoyed that session very much. got to listen to 2 very good singers there. joel was a little cranky there though...HAHAHA they had free flow of drinks over there so i guess i had a little bit too much hot honey...we sang for 4 hours plus sia.....damn shiok. bye josh!!! pls come back soon...and take care! i think my afternoon singing sessions have paid off. yay. needs ktv soon to test out the new songs. SHIHUI! JOEL! TECK KUAN! DEANNE! EDDIE! i have turned into a happy glutton. went to dawn's place for makan yesterday. wow dawn's mom is a really good cook. she cooked sweet fried fish, chicken curries, mushrooms and vegetables, tiger prawns, more mushrooms and vegetables, fried bee hoon...and i think we also had sambal prawns right which they ordered from caterers. yahhh i think i had 3 rounds of food and alot of the very sweet fruit punch. :D then we had the semi-circle love letters and strawberry love letters. then we started to play and watch ppl play mahjong. there were frequent attempts by valmond and i to start a poker or blackjack game since we were the watchers but to no avail. oh it's Chinese new year again!!! whoah so fast!!! went out with jingzhi and priscilla to boat quay on tue. i met pris first at raffles city with the intention of shopping till we drop, but we guessed we overestimated the potential to shop there. yah anyway i bought a dozen donuts from donut factory at basement one, and i found out that there was a new donut shop(J.CO donut and coffee?) just on the other side of the basement floor and they were giving away free donuts. we then walked to singapore river and sat there to talk somemore. we wanted to go to fullerton to look for brandon, then we realised that there were fireworks on that night at marina bay. yah so we managed to catch 5 minutes of the fireworks. we saw brandon at the hotel but he was really busy la yah hhahahahah so we couldn't really talk to him that much. last we went to tcc at circular road and talked somemore. reached home at 12 plus and i had to work morning shift the next day. ARGH this is a post coming from a tired boy. had so much fun eating and talking (gossiping) today at pris's house. yah we ate murtabak and prata for lunch, then went back to pris house for fruits. on the way back we picked up miss low from kembangan mrt station. yah she's still the same old miss low. HAHAHA old as in not old-OLD, but familiar-old. HAHAH yah like still so talkative just like xiuqing. i really loved every minute talking to my old classmates about our lives and also A LITTLE about other ppl's lives. HAHAHA. hahah talked to frances on the train just now. i used to think that she was an innocent girl. hahaha but guess not. we were comparing 'room status' just now. well i declared myself 'vacant clean' while she is actually a 'show room'.